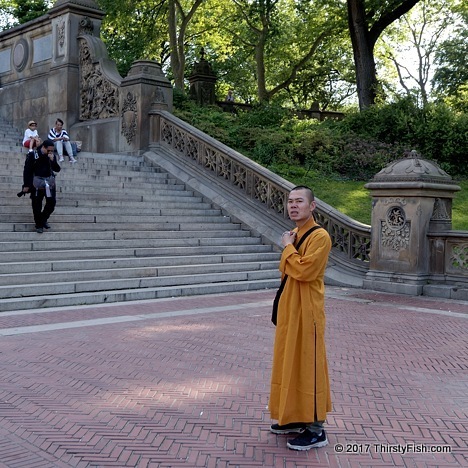 A Buddhist man, trying to raise funds for his organization in Central Park. Once upon a time, charity was a noble act, a benevolent cause. But our rotten culture has managed to transform even charity into travesty. Beside the fact that many American charities are giant money making scams, we are "funding" things that should be the responsibility of corporations or governments. Take for example crowdfunding "platforms" such as GoFundMe, YouCaring, Generosity and even Facebook. These "platforms" take a percentage of money raised for "personal cause campaigns" such as that of Americans drowning in medical expenses which insurance companies and the healthcare system will not cover. About 50% of all fundraising "campaigns" using these platforms are related to healthcare. Beside the cost of care itself, people are also scrambling to raise money for premiums, deductibles, travel expenses and even utility bills they can't pay due to health expenses; Most barely get 10 to 20 percent of what they're asking for. Charity is not and will never be a reasonable substitute to governments, institutions and corporations that fail to fulfill their responsibilities.